KC, I agree with your overthinking point. Bowling to noone the whole time must feel deadening. Competition takes away that feeling of pointlessness. to resort to a tired cliche, he needs to spend some time in the middle. What I don’t understand is how the england setup didn’t act to mitigate this? Surely, with all the psychoanalysis and the ritual of player preparation that goes on now, there should be a structure for players on tour who aren’t likely to play (usually the reserve keeper and second spinner over the last few years)? It would appear not. Time and again we hear of players returning to their counties in a mire of confusion. It’s ridiculous. The worst thing about the Finn situation is its predictability. I feel terribly sorry for the lad (though I think that some of the blame for this must be applied to him). And a final thought, is being overcoached perhaps a cause of this overthinking? Perhaps. If something’s going wrong with a bowler and you’re the bowling coach, you’d feel duty-bound to do something. You’d look for flaws and doubtless you’d find some. From then on, you’re listing all the bowler’s failings and filling their head with even more to worry about. It’s easy to see how constantly available coaching assistance could cripple a bowler. Sometimes you’re at your best only through accepting and ignoring a few imperfections. The off-season is the time for technical changes. If it’s not instinctive by the time you are playing, making more technical changes won’t help. Maybe that’s part of the problem, a lack of an off-season. What a bowler like Finn needs now is time for the technical stuff to move from his brain to his body. In general, this is part of the massive over-management of modern cricket teams. There was a good article in the paper the other day about the lack of mavericks in teams these days, how management structures struggle to deal with anomalies. KP’s greatest triumph (158, Oval, 2005) came about when he threw caution to the wind and just played. That’s been beaten (managed) out of him now, so we can all settle down to an entirely predictable 30-40 in every innings for ever. There have been way to many instances of English players suffering from mental issues over the last few years. Something is seriously wrong with the way this is being managed. Remember when England’s B Team was rated by some as the third best bowling attack in the World behind England and South Africa? As Matthew Hoggard used to say (a bit too much in the end), just run in and wang it down. Isn’t this basically what happened to Jimmy A when they tinkered with his action? Pretty much, but he also got a stress fracture as a bonus. If he’s got Yips, that’s game over. No coming back. Poor lad. He’s been Scott Boswelled. He better work on his batting or keeping – that’ll give him a better chance playing for England again. Another idiom to add to the locker. Seems England have Indian pace bowlered him. Poor old Steven Finn-egan begin again. I’ve become very ambivalent to cab sav. If I were Steven Finn, I’d be pouring myself a tempranillo. Most middle-class comment ever. Congratulations, Dan. Steven Finn doesn’t have discretion in matters such as these. The England team management have a carefully selected red wine for fast medium bowlers who’ve been sent home for being unselectable. On Wednesdays. The management red wine selection would, presumably, be Merlot. I don’t think Finn has the yips and I do think he has a good chance of coming back as a star bowler. Do bits and pieces players prefer GSMs? In other fast bowler news, as Alex Bowden points out in his Twitter roundup, Kemar Roach has A Funky Funky Style With A Funky Swag. A small amount of research on my part found those lyrics in Method Man by Trillmatic ft. A$AP Nast. 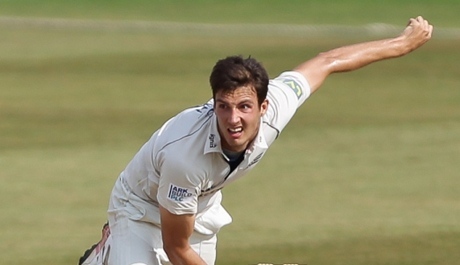 Perhaps Steve Finn merely needs a funky funky style with a funky swag and he’ll get his mojo back in no time.